The City of Auburn Library Board engages in the development of policies for the Auburn Public Library. The Library Board works with the Library Director in reviewing and formulating policies for providing our community with the best possible library service. Board members also work with the Library Director in strategic planning for the library’s continued quality and sustainability. is eligible for a card through the Horseshoe Bend Regional Library. Any dependent or minor child whose parent or legal guardian is eligible for free borrowing privileges shall be granted the same status. Individuals not meeting the above criteria may get a library card by paying a non-refundable fee of 25 dollars per person, per year. All applicants must provide valid identification. Any applicant under eighteen years of age must have a parent or guardian present to sign the application and show valid identification. *Being employed in Auburn is defined as: (1) being employed by an Auburn business which possesses a current City of Auburn business license, (2) being self-employed and possessing a current City of Auburn business license, or (3) being employed by a government entity whose office or school is located within the Auburn city limits. Downloadable media includes those titles made available to library patrons through the City’s contractual service with CloudLibrary. Any circulating item may be renewed up to three (3) times, provided that the item has not been placed on hold at the request of another patron. Circulating items may be eligible for additional renewals at the discretion of the library staff. The library will place on hold items in circulation as requested by a patron. return all materials borrowed on time to the Auburn Public Library. pay or otherwise resolve all fines and fees. present library card, picture identification, or library card barcode via an app on a smartphone or mobile device for each check-out. Borrowing privileges will be denied to patrons with one or more overdue items, or who have more than $10 in overdue ILL fines, or who have any outstanding charges for lost or damaged items. The full retail price will be charged for any lost or damaged item. Patrons have the option either to pay the full retail price or to replace the item with an exact replica in new condition. The item must have the same ISBN to ensure it is the same format and edition as the original item. Damaged items paid for by the borrowing patron are still the property of the library and will be disposed of at the discretion of the library staff. Additional materials may not be checked out until all charges for lost or damaged items have been cleared. Requests made by telephone are not accepted. Patrons must complete and sign a written request to obtain materials through interlibrary loan. A bibliographic citation is required for all requests. Library staff can assist patrons in obtaining appropriate bibliographical information. Each patron will be limited to two (2) active requests at any given time. Active requests include those being researched by staff, those with materials in transit, and those with materials currently checked out to the patron. Books published within the previous twelve months. Books on current bestseller lists or those receiving any other type of heavy usage or attention. Audio-visual materials, microforms, and other non-book formats. Items usually requested as “document delivery services,” including copies of magazines and journals not available through the Library’s online resources. Easy fiction, unless the patron’s request is related to scholarly research. Multiple copies of requested titles. Rare, one-of-a-kind, excessively expensive, and/or irreplaceable items. The Auburn Public Library reserves the right to deny an ILL request if attempting to fulfill the request is deemed to be not in the best interest of the library. Students from Auburn University or any other higher education institution should consult with their institution’s library to request items on class bibliographies. Items instructors may have placed on reserve at their institution’s library should be requested there. Faculty, staff, and students with borrowing privileges at Auburn University’s library or any other local higher education institution will be asked to use their institution’s ILL service for requests related to academic assignments or scholarly research. Requests for genealogical materials are generally not accepted unless a complete bibliographical citation is available and names of people to be researched are stated. The library staff cannot guarantee how long it will take to obtain materials via ILL.
All conditions set forth by the lending library will be honored. Renewals are not permitted on items obtained via ILL. Each item must be returned by the due date shown on the ILL sleeve. Patrons must agree to accept full responsibility for items borrowed while the items are in their care. Overdue fines for ILL items are charged at a rate of $1.00 per item, per day, up to the full replacement cost of the item. Patrons must agree to pay in full any and all bills for materials lost, stolen, or damaged, including the full replacement price charged by the lending library, any processing fee that may be charged by the lending library, and a $25.00 processing fee charged by the Auburn Public Library. Although postage and related charges are generally absorbed by the libraries involved in most of our ILL transactions, patrons must agree to pay for such charges if they are incurred. All library borrowing privileges, including use of public access computers, will be denied to any patron who fails to return or pay any related charges for ILL items. Abuse of the ILL service, including excessive lost/damaged materials or overdue materials, may result in permanent revocation of ILL privileges. Requests made by telephone are not accepted. A written request will be required. The library reserves the right to deny any request for materials from another agency when need by local patrons is anticipated. Items are sent on loan for a period of six (6) weeks. Renewals are generally not granted as the library tries to provide a liberal loan period. Any borrowing library that fails to return a book on loan, after a sufficient waiting and notification period, will be billed for the retail cost of the book. The Auburn Public Library reserves the right to set forth special conditions on books loaned. Patron contact information will be updated every 2 years. Patron accounts will expire 4 years after issuance, except for paying non‐resident accounts, which will expire every year. Have been inactive for a period of 4 years, including use of digital resources. Removal will be performed during overnight processing for records that have come into eligibility. As activity dates in patron accounts are updated whether borrowers have been verified for circulation processes or for access to digital resources, patrons who use their library accounts only to access digital resources will not be removed from the database. Information regarding the library materials an individual patron uses is confidential and will not be divulged to another individual or to any agency unless Auburn Public Library is presented with a court order to do so. Requests from library patrons for personal account access and updates (renewals, holds, etc.) may be made through a variety of means, including but not limited to email and telephone, provided that the communication offers acceptable verification of the patron’s identification, such as an email sent from the account associated with the patron’s registration or the patron providing verbal documentation of contact information. Library staff will make this determination, as appropriate. The Collection Management Plan is intended to provide guidance, within budget and space limitations, for the selection and evaluation of materials which anticipate and meet the needs of the Auburn community. It directly relates the collection to the library’s Mission Statement and defines the scope and standards of the collection. As the community changes, the library will reassess and adapt its collection to reflect new and differing areas of interest, concern, and formats. The Collection Development Policy will periodically be evaluated and revised as necessary to provide guidance for implementing changes throughout the collection. In support of its mission, the Auburn Public Library fully endorses the principles documented in the Library Bill of Rights and the Freedom to Read Statement of the American Library Association. The library upholds the right of the individual to access information without restriction, even though the content may be controversial, unorthodox, or unacceptable to others. Materials available in the library present a diversity of viewpoints, enabling citizens to make the informed choices necessary in a democracy. connecting readers of all ages and audiences with resources arranged to facilitate effective and appropriate discovery through browsing. The Auburn Public Library functions as a provider of information on many topics, levels, and opinions. To meet its goals and objectives, the library must protect the freedom of all to choose their own information in their preferred format. The responsibility of the library is to serve the entire community, not to promote ‐ and above all, not to censor ‐ any particular political, moral, philosophical, or religious conviction or opinion. Patrons with concerns about the content of any library materials will be asked to follow the steps outlined in the section of this manual entitled Reconsideration of Library Materials. 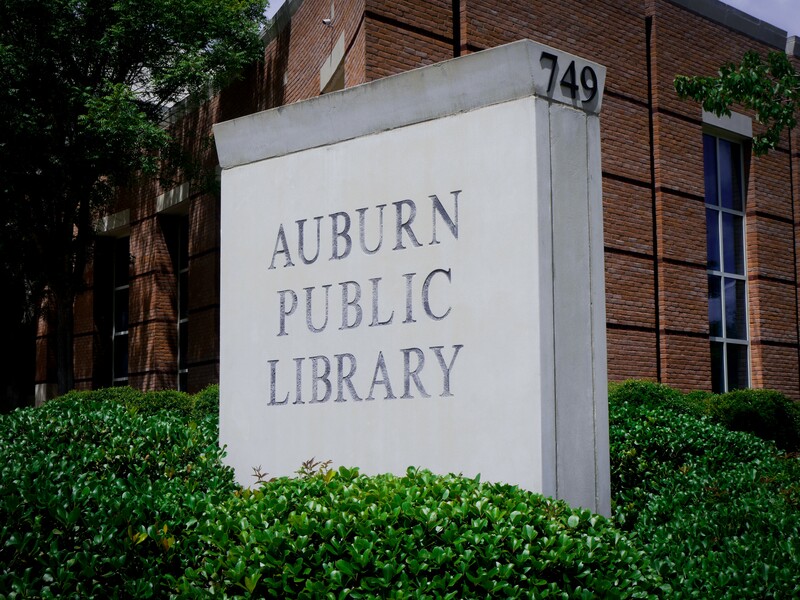 The primary responsibility of the Auburn Public Library is to serve the residents of Auburn by providing a broad choice of materials to meet their informational, educational, cultural, and recreational needs. Materials are selected to aid individuals, groups, and organizations in attaining practical solutions to daily problems and to enrich the quality of life for all community members. Major emphasis is placed on educational and recreational needs; therefore, a broad choice of print and non‐print materials is selected to accommodate the diversity of reading levels and interests of users of all ages. The interests and needs of the actual and potential users of the Auburn Public Library are continually evaluated so that the library has a collection reflecting the community that it serves. While the library serves the basic reference needs of the community, budget and space limitations, as well as local needs, preclude the library from duplicating the specialized and comprehensive collections that exist elsewhere in the immediate area. Access to these collections is provided through interlibrary loan and direct referral. Ultimate responsibility for managing library collections rests with the Library Director, who routinely delegates aspects of selection and deselection to professional library staff. Purchase requests made by library patrons are an important consideration in materials selection. Titles suggested for purchase are subject to the same selection criteria as other materials and are not automatically added to the collection. It is the library’s intent that suggestions for purchase be used to help the library in developing a collection that serves the needs of the community. Widely diverse points of view, including controversial and unorthodox subjects, will be available in the collection. Inclusion in the collection does not imply library approval or agreement with the contents. The Board of Trustees and the Library Director recognize that some materials are controversial and that any given item may offend some patrons. Selections will not be made on the merits of any anticipated approval or disapproval but solely on the merits of the work in relation to building the collection and to serving the interests of all the library’s patrons. The library retains unconditional ownership of the gift. The Library Director makes the final decision on the use or other disposition of the gift. Gift materials will not be tracked beyond the means necessary for established statistical purposes. Donations of money designated for the periodicals and newspapers collection are accepted in lieu of actual subscriptions. These contributions offset the high cost of periodical subscriptions and maintain the continuity of subscriptions from year to year. Donors of the funds may suggest subjects or titles to be acquired with their donation, but the library reserves the right of final decision. The library offers memorial and honorary bookplates that can be attached to materials purchased with money donated for this purpose. Because of the cost of handling special collections, the library reserves the right to evaluate such collections individually. Groups or collections of materials cannot necessarily be kept together. Multiple copies of materials are purchased in response to patron demand as evidenced by number of holds, anticipated popularity, repeated requests, and monitoring of the collection. For popular fiction and non‐fiction titles, the Auburn Public Library strives to maintain a ratio of one copy for every five holds placed on specific titles by library patrons; however, exceptions may be made depending on demand, timeliness, and availability. The library’s collection includes a wide variety of contemporary works of fiction representing all genres, international works, and important novels of the past. The library places emphasis on acquiring fiction that is representative of the diverse community that it serves and satisfying the range of interests and recreational needs of its users. Because of the volume of new fiction published each year, very few titles will be collected retrospectively. Exceptions will be made for new editions or translations of essential classic titles or to replace missing or worn copies of works with enduring popularity. Special emphasis is given to providing multiple copies of high‐demand titles in order to fill patron requests as quickly as possible. The large print book collection strives to meet the needs of visually impaired patrons. Emphasis is placed on popular fiction, including mysteries and westerns, along with high interest non‐fiction, such as biographies and health‐related materials. The print collection of newspapers and magazines provides current and retrospective information aimed at meeting the research and recreational needs of the community. The collection also contains periodicals that serve the professional reading needs of the library staff. Periodicals supplement the book collection by providing up‐to‐date information, covering current topics not yet available in books, and presenting a less in‐depth treatment of a subject than is usually found in books. The periodical collection consists of a diversity of publications in fields that are of current interest to the community. It includes basic and popular reading magazines and a small selection of business, trade, financial, and local publications. Journals that are highly technical or scholarly are generally not included in the collection. In addition to magazines, the collection includes newspapers published locally and nationally. Within a limited retention model, back issues of some magazines are available for review. As part of the reference collection, the library provides Auburn residents with information on local government actions, services, and programs. Additionally, reports produced by the City of Auburn are made available for public review. Depending on the nature of the content, some of these materials will become a standing part of the collection, while others will be discarded when no longer in demand. Certain literary works and educational materials may be designated as non‐circulating and utilized in the library to support library programs. Recognizing the responsibility of schools and universities to provide access to required textbooks for their students, the Auburn Public Library does not acquire textbooks required for school curricula. The library may elect to acquire textbook‐style works in order to provide broad or introductory coverage in high‐interest subject areas if other survey materials are not available. The library’s goal is to provide a collection of instructional, educational, and recreational‐based audio and visual materials that will enhance the library's existing fiction and non‐fiction collections. The media collection will follow the same selection and deselection criteria as other library collections. Periodically, new forms of media are introduced and are studied carefully to assess their suitability for public library use. Sufficient time is given to properly determine whether they will receive lasting and widespread acceptance before they are adopted by the library. Digital resources consist of content that is accessed via computers and mobile devices. These resources are often referred to as databases or as online or electronic media. The library collects a variety of digital resources that may include some or all of the following: full‐text periodicals, reference sources, images, electronic books, both textual and audio, and streaming video. Through digital resources, the library aims to extend access to library information, as patrons can access these collections within or beyond the physical library facility. The electronic format enables increased usability of library resources and improved searching and interactivity. Because these resources expand the depth and breadth of the collection, the need to purchase some resources in print format is alleviated. The Auburn Public Library Board of Trustees recognizes that the Auburn Public Library serves a community with diverse interests and needs. To that end, the Library strives to build a collection that will entertain, enlighten, inform, and inspire our patrons. At the same time, the Library Board of Trustees also recognizes the right of citizens to question materials that have been purchased for the Auburn Public Library collection. A patron who objects to a particular title in the library collection may express his or concerns to a staff member. The patron may be referred to the current building supervisor, the Assistant Library Director, or the Library Director, who will explain the library’s collection management policy. If the patron still objects to a particular title in the library collection, then the patron may state his or her opinions and concerns in writing and request a formal reconsideration of the title in question. The patron will be asked to complete the Request for Materials Reconsideration form, which is given to the Library Director. The Library Director will review the patron’s concern and will assemble a review committee consisting of three librarians. The review committee will examine and evaluate the material in question in its entirety to determine whether or not the item was selected in accordance with the library’s Collection Management Policy. The Library Director will review the committee’s recommendation and make a decision regarding whether or not the material in question was selected in accordance with the library’s Collection Management Policy and whether the item should be retained, removed, or reclassified. The Library Director will respond to the patron in writing to inform him or her about the status of the library material in question and to explain the review committee’s reasoning behind their decision. The Library Director will inform the Auburn Public Library Board of Trustees about the matter at their next regular meeting. If the patron is not satisfied with the decision reached by the review committee and the Library Director, then the patron may express his or her concerns during Citizens’ Communication at the next regular meeting of the Auburn Public Library Board of Trustees. At that time, the Auburn Public Library Board of Trustees may elect to evaluate whether or not the item was selected in accordance with the Collection Management Policy and may determine whether the item should be retained, removed, or reclassified. The decision of the Library Board shall be considered final. The Auburn Public Library collection is continually maintained and evaluated through deselection of unused, outdated, outmoded, and worn materials. The systematic removal of materials from the collection, or deselection, is an important component of total collection development. Ongoing evaluation of materials is necessary in order to maintain a current, accurate, and inviting collection. Deselection improves the accessibility of the remaining materials, enhances the appearance of the collection, and helps improve the overall circulation of materials. Maintenance of the library’s collection through constant re‐evaluation by the library staff ensures its usefulness and relevancy to the community. This evaluation depends heavily on the professional expertise of the library staff in assessing the needs of the community in relation to the content of the collection. Deselected materials cannot be reserved. Discarded materials become surplus property and may be sold by the Friends of the Library for fundraising purposes or otherwise discarded at the discretion of the Library Director. The Auburn Public Library extends free use of public access computers to all users of the library. The Auburn Public Library will not limit the access of any library resources, materials, or services due to a patron’s age, origin, background or views. This includes free access to, and unrestricted use of, all the technology resources that the library offers. The Auburn Public Library does not monitor and has no control over the information accessed via library computers and via the internet, and the library assumes no responsibility for its content or for any damages, direct or indirect, arising from its use. As with other library materials, parents and guardians of minor children must assume responsibility for their children’s use of library computers and the internet. Librarians and library governing bodies cannot assume the role of parents or the functions of parental authority in the private relationship between parent and child. The Auburn Public Library will not assume, abrogate, or overrule the rights and responsibilities of parents and guardians. We maintain that only parents and guardians have the right and the responsibility to determine their children’s—and only their children’s—access to library resources. Parents and guardians who do not want their children to have access to specific library services, materials, or facilities should so advise their children. The Auburn Public Library, in accordance with Alabama state law, strictly prohibits viewing material that would be classified as obscene and/or pornographic. Material will be deemed pornographic if the average person, applying today's community standards, would find that the work, taken as a whole, appeals to the prurient or sexual interest, as defined in the Code of Alabama. Any material not considered obscene/pornographic by these standards is allowed to be viewed by all patrons at the discretion of the viewer and their legal guardian if applicable. Auburn Public Library staff may proctor examinations for library patrons in good standing and for non-patrons who can show proof of residence or employment within the city limits of Auburn. Proctoring examinations is not a primary library service. This service will be offered only so long as it does not interfere with the performance of regular duties of the library staff. The Library Director will establish procedures to be followed. The Auburn Public Library will make a reasonable effort to make library-sponsored programs available to patrons who are deaf or hard of hearing. Preferential seating will be given to patrons who are deaf or hard of hearing who let us know they need to be seated close to the speaker. If possible, a signing interpreter will be provided for patrons who are deaf or hard of hearing when those patrons inform us in writing at least fourteen days prior to an advertised library-sponsored event that they will attend. The Auburn Public Library will make reasonable efforts to locate an interpreter for the occasion. The Auburn Public Library will pay the fees charged by the interpreter if the library budget has sufficient funds to do so. Staff members on duty at the Circulation desk will make every reasonable effort to render aid to patrons who have physical disabilities or limitations who require assistance while entering or exiting the building. The message board, the display case, and the bulletin boards are for library use only. Notices, displays, or exhibits for civic or nonprofit, nonreligious groups may be permitted if space is available. The decision to display any material will be made by the Library Director. The Auburn Public Library reserves the right to accept or reject non-monetary gifts such as books, magazines, videos, furnishings, equipment, etc., with the understanding that the gifts will be used or disposed of as the Library Director chooses. The library reserves the right to accept, dispense, or discard, at its discretion, any donated items. Donated materials may be added to the collection, sold in the Friends of the Auburn Public Library book sales, or recycled or discarded. Money raised by the Friends will be used to benefit the Auburn Public Library. Library staff will not evaluate for tax purposes the worth of such gifts to the Library. All gifts made to the Auburn Public Library become the property of the City of Auburn. The Auburn Public Library will accept monetary donations to purchase library materials in memory or in honor of a particular individual. Donations given for these purposes will be directed to the Friends of the Auburn Public Library Auxiliary Account. The processing of such donations will be facilitated by the Collection Development Librarian, in consultation with the Library Director, as well as with the donor and/or the individual in whose honor the donation is given and/or the family of the individual in whose memory the donation is given. The selection and retention of materials purchased with memorial and honorary donations will be in accordance with the library’s Collection Management Plan. The Auburn Public Library accepts other monetary donations through the Friends of the Auburn Public Library. The Auburn Public Library Board, in consultation with the Library Director, reserves the right to accept or deny any gift or donation, particularly if any conditions associated with the gift are not acceptable to the Board, if the conditions associated with the gift do not align with the Auburn Public Library’s mission statement, or if acceptance of the gift would otherwise not be in the library’s best interest. If no conditions are attached to the gift, the donation will be acknowledged and used in a way that is deemed mutually acceptable to the donor and the Library Board. The Auburn Public Library welcomes applications from patrons (age 14 and older) who wish to support the library as a volunteer. Volunteers will augment and support basic library services, but they will not be a replacement for paid staff positions. Patrons (age 14 and older) who volunteer with the day-to-day operations of the library. Members of the Friends of the Auburn Public Library who volunteer to assist with the Friends’book sales or who assist with the day-to-day operations and maintenance of the library. The Library Director, in conjunction with library staff, will develop procedures for the recruitment and selection of volunteers, as well as the management of the volunteer program. All volunteer applicants who are 19 or older will be subject to a background check. All volunteer applications indicating a criminal history will be reviewed by the Library Director. Applicants with a criminal history will only be accepted if the Library Director determines that the acceptance of the applicant will not jeopardize the safety of Auburn Public Library patrons and staff or the safety and integrity of APL resources. All library volunteers are expected to perform assigned job duties and to follow library rules. A volunteer’s term of service may be ended for failure to perform assigned job duties or for violation of library rules. The library staff reserves the right to end a volunteer’s term of service at any time. A volunteer whose term of service has been ended for any one of these reasons will not be allowed to reapply. The organization volunteers as a group. The organization is supervised by an organization staff person or representative. The activity for which the group volunteers is a single event. The Auburn Public Library will work with the Municipal Court to accept volunteers who have a courtordered community service obligation on a case-by-case basis. The Auburn Public Library inspires people to explore new ideas, pursue their dreams, and change their lives. We help people build connections with their world and with each other. We contribute in meaningful ways to an engaged, literate, and informed community. We embrace principles of equity, diversity, and inclusion in our collections, programs, and services. It is the responsibility of the Library Director to establish procedures regarding the daily operation of the library. To ensure a safe, comfortable environment and to ensure that all our patrons receive the best possible library service, the Board of Trustees has adopted the following policy. All patrons are required to comply with this policy. Any conduct that violates Federal, State, or local law, ordinance, or regulation. Selling and/or soliciting, except as permitted under Federal, State, or local law, ordinance, or regulation. Exceptions may be made for situations that are directly related to a Library program and/or with approval in advance by the Library Director. Distributing or posting promotional materials that have not been approved by the Library Director. Messy, odorous, or greasy foods; uncovered beverages; and food deliveries. Covered drinks and non‐messy, non‐odorous snack foods (such as individual “snack‐size” servings of chips, cookies, candy, or energy bars) are allowed. Possessing, consuming, or being under the influence of alcohol or illegal drugs. Smoking or other uses of tobacco. Bringing animals or pets into the library with the exception of assistance animals as defined by Federal and State law. Any loud, unreasonable, and/or disturbing noises created by persons or mechanical or electronic devices. Intentionally damaging, destroying, or stealing any library property or any patron’s or employee’s property. Violating the Library Board’s Unattended Child Policy. Misuse of rest rooms, including shaving or bathing. Carrying weapons of any type on one’s person in violation of any State law. Engaging in disorderly conduct, fighting or challenging to fight, or using offensive words likely to provoke violence. Using obscene or abusive acts and/or language. Failure to comply with this policy may result in exclusion from the library for the day, for a period of time to be determined by the Library Director, or permanently, or in arrest. Children of all ages are encouraged to visit the library with their parents to take advantage of the resources available. The Library Board emphasizes that a child’s health, safety, and behavior while in the library are the responsibility of the parent or guardian. While the Library Board is sympathetic to those families who have difficulty finding appropriate child care, the library cannot assume that level of responsibility for these children. Children who patronize the library should be encouraged to learn appropriate use of library resources and to respect other patrons. A child will be treated with the same respect as any person. Children age seven (7) or younger must be accompanied by a parent or responsible caregiver age sixteen (16) or older at all times. To attend a scheduled, supervised library function. Parents should return to pick up the child as soon as the program is over. To work on a specific project such as a school assignment. To select library materials to be checked out, to do research, and to read. In the above situations, a parent or guardian must be immediately able to get to the library should any problem arise. If, in the judgment of library staff, an unattended child requires parental supervision, library staff will notify the child’s parent or the appropriate authorities. Library staff will not assume responsibility for keeping the unattended child within the library building nor will they assume responsibility for the safety of a child once he/she leaves the library. Under no condition will a library employee provide transportation for a child. In case of an emergency involving an unattended child, library staff will call 911 for help and report to the authorities that the child’s parent is not present. When, in the judgment of the library staff, a child is required by his/her parent or guardian to remain at the library on a regular basis in lieu of day care, library staff will notify the appropriate authorities and action will be taken by the Library Board.